Dimensions: Length: .375", Shank Diameter: .25"
Thru-bolt 10-24 stainless #107 pan head machine bolts from the interior. Truss head barrel nuts - mounted through the outside of the trim ring. Flush mount barrel nuts - are counter sunk, covered by the trim ring with no fasteners visible. 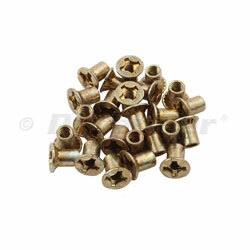 Self tapping stainless steel screws for installing in wood or metal. Heads of fasteners must fit the holes of the window frame. They can not be too large or too small. Through bolting with barrel nuts is one of the best ways to secure a window to the cabin wall or cockpit. By mounting the window in a solid, secure surface, through bolting with barrel nuts will help prevent the window from shifting insuring a sound seal (with proper caulking) for years of trouble free use. Under no circumstances should flat head fasteners (counter sunk) be used. Damage will result. Once the window is centered, have someone place and hold the trim ring while the fastener holes are drilled with the 3/16" drill bit from the inside. Once all the fastener holes are drilled, remove the trim ring. Next, change the bit to 17/64" (6.75 mm) (Metric equivalents for drill bits have been estimated). Red rill all the holes on the trim ring with the 17/64" bit. This will provide enough space to fit the truss head barrel nut sleeve into the trim ring with room for caulk. Enlarge the fastener holes in the cabin wall from the outside with the 17/64" bit to accommodate the 3/8" ( 9.5 mm) depth. Remember the trim ring is 3/16" (4.75 mm) thick, so the outside fastener hole depth will only need to be 3/16" ( 4.75 mm) in depth if using 1/2" (12.5 mm) shank barrel nuts, the outside fastener hole depth will need to be 1/8". DO NOT ENLARGE THE HOLE IN THE WINDOW FRAME. Once the window is placed and centered in the hole, drill through the cabin wall from the inside with the 3/16" (4.75 mm) drill bit. Once the holes are drilled, change bits to the 17/64" . Measure the length of your drill bit 3/8" up from the bottom and place a piece of tape to indicate the distance. Red rill the fastener holes in the cabin wall from the outside to the 3/8" depth. This will provide the appropriate amount of space and length for the shank of the flush mount barrel nut. Next, change drill bits to the 1/2" counter sink. Carefully use the counter sink bit to create the necessary amount of counter sink. You will need to check periodically with a barrel nut to ensure proper fit. WARNING: the 1/2" counter sink bit is too large, and is only meant to be used to create sufficient taper for the barrel nut to sit flush, not above the surface. You may find during the dry mount installation that the bolts are too long. Often it is difficult to find the correct length due to the variation in the wall thickness. It is a good idea to purchase one size up and down (1/8" longer and shorter) to accommodate the potential differences. A good rule of thumb is hull thickness plus 1/8" for determining the proper bolt length when using flush mount barrel nuts.